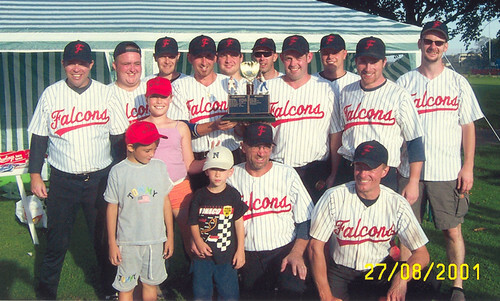 Another BBF reshuffle and the merger with BSUK mean that the Falcons would still be in the First Division for 2001. Having lost so many players and so many games in 2000 it was a relief to recruit some new players. Andy Cornish began to start training with the Falcons and Steve Robertson and Stuart Carter signed up. Whilst the Falcons now had enough new players to continue as a team, most were rookies. They quickly realised that 2001 would need to be a building season. The results for the season reflected this. They only won five games and lost 13. Also for the first time ever the Falcons forfeited a fixture. There was little to cheer about in their league performance, they did managed to win the Old Timers August Bank Holiday Tournament, providing some reasons to celebrate. At the end of this season Dominic decided it was time to leave the Falcons. Earl also chose to go to Windsor where his son was now old enough to play. The Falcons had survived 2001. It was decided that Stuart Boast was the man to take over the helm in 2002.